Mixed Media Encaustic. Traditional 16x20 canvas. Given as a gift to my folks for their 50th Wedding Anniversary. “If you abide in My Word, then you are truly disciples of mine.” John 8:31. Abiding comes from the Old English abidan, gebiden meaning “to remain, wait, delay, remain behind.” The Greek word for abide is translated abide, remain, dwell, continue, tarry, endure. It means to continue to be present, to be held or kept, to last and not to perish, to endure, to survive and live in a condition of waiting [Strong’s 3306]. Materials and other elements: Almost all the florals used come from my folks vow renewal event in 2006. Other elements included encaustic gesso, crayon wax, and metal embellishments. 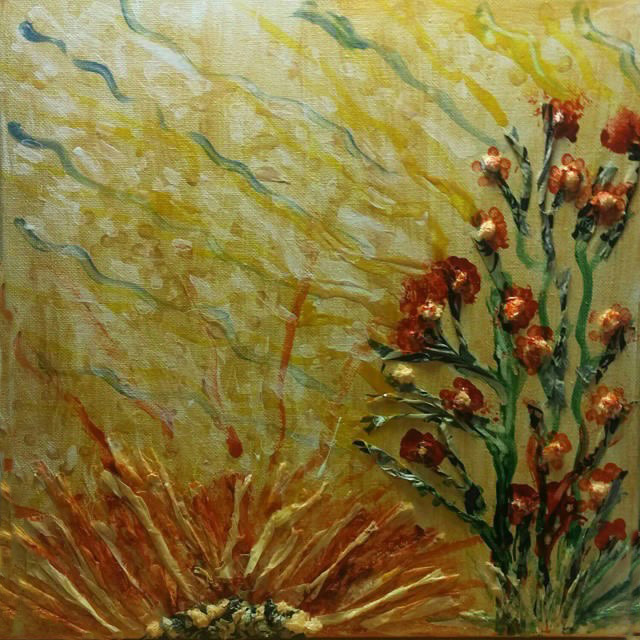 This is an encaustic piece. 12x12 Canvas Panel. Encaustic means two things…using some kind of wax, usually beeswax, but can also be crayon wax and it means to create using heat. Using a sharp object I made a few scratches into it while it was a little soft. In the end it made me think of sand dollars on the beach. I named it Adam as in the story man and woman was made from the earth. My favorite verse for this one is 1 Corinthians 15:45 “And so it is written, ‘The first man Adam was made a living soul; the last Adam (was made) a quickening spirit.” The second Adam, of course, refers to Jesus. 20x20 Traditional Canvas, Mixed media encaustic, Alah is Hebrew for leaf, also meaning to go up, ascend, climb or approach according to Strong’s concordance. Genesis 3:7 says “Then the eyes of both of them were opened, and they knew they were naked, and they sewed fig leaves together and made for themselves loin coverings.” It was a sermon I heard which inspired this artwork. The idea was that like the way Adam and Eve tried to “cover up” the issue with leaves, we use our own set of means or methods (leaves) to fix our problems instead of just coming to God. Our own way is inadequate. But the promise given to our first parents extends to us if we will just act on it. That promise of a Savior which is Jesus Christ. I love autumn actually with its falling leaves and in so many colors. A nice reminder of the beginning of things and promises. Alien depicts the outcast state of the Christian in the world. A sojourner passing through. In John 17:16 Christ says, “They are not of the world, even as I am not of the world.” While this piece seems at first to be gloomy, it is actually a message of hope for the believer. The term alien gets used a lot these days to describe any number of groups of people. The scriptures also say that a servant is not above his master. The student not above the teacher. It is a message of hope in the sense to say that our path is par for the course. It is expected; it is normal. Though, it will not be forever. Materials included blue tissue wrap, encaustic gesso, and crayola crayon wax. Song of Songs 4:7 “You are altogether beautiful, my darling, beautiful in every way.” A comment on womanhood and more. Others have described it as having an almost Victorian vibe with a hint of steampunk. I think another translation of Song of Songs says “there is no flaw in you…” Perhaps the flaws in ourselves and in our art is part of the beauty? Materials include scrapbook paper backgrounds, charms, ribbons and other fibers. 12x12 Burlap Canvas, Traditional. Mixed media acrylic and oil pigment. “This is what the Lord of the Heavenly Armies says: ‘There will be old men and old women sitting in the parks of Jerusalem, each of them holding canes in their hands due to their old age! The city parks will be filled with boys and girls. They will play in the city’s open parks.” Zechariah 8:4-5. As an abstract, I tried to give a sense of something part of childhood and that was playing with jacks. The design over the canvas I think implies the lands and sea of the world. Materials included were a TCW stencil with a combination of acrylic paints and pigment oil sticks by R&F. Whether in the sea below or in the sea of space, creation awakes in worship. Materials include acrylic and fabric paints applied through fingerpainting. “Now may the God of hope fill you with all joy and peace as you believe in Him, so that you may overflow with hope by the power of the Holy Spirit.” Romans 15:13. I have been told people see hands brought up in the form of prayer. I think I see that now. Perhaps I will leave it that way. Abstracts are so neat like that. Materials include crayon wax and tissue wrap. Etchings made with an exacto knife. Ben (Benevolence) 10x10. Mixedmedia collage. “Rejoice with those who do rejoice, and weep with those who weep.” Romans 12:15 (NKJV). In a world where everyone seems to be under attack and we are busy defending ourselves, this verse calls on us to be sensitive to what is happening with those around us. If something good has happened to someone else, let us be happy with them. If someone is hurting, weep with them. Don’t argue about whether or not they were right or wrong. In the context of Romans chapter 12, we are not to do or be as the world. We are to consider others better than ourselves. When all the world would do is tear down, we need to build up. Materials: Background a faux leather look made from paper bag material where you use a glue and water base and apply pieces of paper bag material overlapping and dry with a heat gun. I also added acrylic paints in browns and soft yellow. Texture with cork board scrap paper pieces under the paint. Teddy bear made with a stamp and black paint. Protected with a sealer. Story: Mazzaroth aka The Zodiac has a spiritual message to it that speaks of the gospel of Christ. I learned about this reading E.W. Bullinger’s book, The Witness of the Stars. Today the common understanding behind the Zodiac leads to astrology as apposed to astronomy. As I work on depicting each constellation and what the true meaning was, I hope to retell the true story and meanings behind the symbols which ultimately point to Jesus Christ. I start with Virgo, aka Bethullah, the constellation which depicts the first coming of the Messiah and the Virgin Birth. The sign Virgo is for the Promised Seed of the woman. This is the beginning of the first book, The Redeemer (his first coming) “The Sufferings of Christ.” The first book is occupied with the person of the Coming One. It covers the whole ground, and includes the conflict and the victory of the Promised Seed, but with special emphasis on His Coming. The book opens with the promise of His coming, and it closes with the Dragon cast down from heaven. In the symbolism of this constellation you have words which mean woman, branch, and ear of corn. Also, I include Coma, which is the Mother and Child in the lower left hand corner. In Genesis 3:15 she is presented only as a woman, but in later prophesies her nationality is defined as the stock of Israel, the seed of Abraham, the line of David; and further, she is to be a virgin. Isaiah 7:14 “Behold a virgin shall conceive and bare a son, and shall call his name Immanuel.” This is also quoted in Matthew 1:23. The other is connected with his second coming…. “For unto us a child is born, unto us a son is given; and the government shall be upon his shoulder; And his name shall be called Wonderful, Counselor, The Mighty God, The Everlasting Father, The Prince of Peace. Of the increase of His government there shall be no end.” (Isaiah 9:6-7) also quoted in Luke 2:11 and 1:22-23). “He heals the brokenhearted, he binds up their wounds.” Psalm 147:3. Materials: Acrylic paints in charcoal black, soft yellow, and burnt sienna. Glass glitter and tea dyed ribbon fibers. Journaled verse in gold marker. Story: This was made during a time I sought answers during a difficult time in my life. Sometimes life experiences are negative ones but the Lord is always aware of our pain and He is the healer. His ways are mysterious in how He can take the darker threads of our lives and weave them to our good. Praise God! Materials: Tissue wrap, Crayola crayon wax, and a heat embossing gun. Thought: Ever had an amazing encounter with God that particularly stands out? I did. It wasn’t a burning bush, but once I did hear the Lord speak to me, clear as crystal. No doubt this was a miracle in the story in itself, but I also see something else. “Moses saw that though the bush was on fire, it did not burn up.” Why? Because God happened to be there in its midst. Our own lives can feel like they are on fire, but we don’t burn up because the Lord is there with us. Materials: Encaustic wax (beeswax) from Enkaustikos, Crayon wax by Crayola, and Fabric Puff paint by Tulip. Story: Calliope is defined as that which holds to music and poetry. Harmony in music and eloquence in words. My first job consisted of working in an amusement park. This piece reminds me a little bit of the main attraction in the park which was the Carousel. Also at that time I wrote a lot of poetry. “I will incline my ear to a proverb; I will solve my riddle to the music of the lyre.” (Psalm 49:4). Materials: Acrylic and Gouache paints, napkin papers in red and white. Story: This is my artistic version of the legendary dogwood tree. While the stories behind it are legend, I find it a significantly appropriate symbol of Jesus’ sacrifice on our behalf. Spiritual royalty…..we live in this world but we are also citizens of another kingdom. As the Lord’s Holy Spirit lives within us, we are in the presence of royalty and we are granted to be part of that. “for you are a chosen race, a royal priesthood, a holy nation, a people for God’s own possession, so that you may proclaim the excellence of Him who has called you out of darkness into His marvelous light; for you once were not a people, but now you are the people of God; you had not received mercy, but now you have received mercy…..1 Corinthians 15:58. “Listen, my beloved brethren: did not God choose the poor of this world to be rich in faith and heirs of the Kingdom, which he promised to those who love Him? Therefore, as God’s chosen people, holy and dearly loved, clothe yourselves in tender compassion, kindness, humility, gentleness and patience.” Colossians 3:12. Story: It is said that when Moses had been in the presence of God, he glowed so that he had to wear a veil for a time when going back to the people. I think about those in my life I know are believers. I grew up with a friend of mine on the same street. I caught up with her from time to time later when we had grown up. I had always known she was a believer. But later in life I could see it all the more in her. I saw someone else in high school who was otherwise a total stranger to me, but the Spirit showed me she was also a believer. A sense of royalty, of family connected through Holy Spirit, in Christ Jesus. “Then Jesus laid his hands on his eyes again; and he opened his eyes; his sight was restored and he saw everything clearly.” Mark 8:25. Materials: Fabric pieces, embroidery floss, acrylic and fabric paints, stickles. Thoughts: Some days are just not clear to me. I have mud in my eyes and a pain in my head. It’s nice to know that God can help us through those times. He still gives sight to our blindness. 12x12 Canvas, Mixed media of oil, watercolor and pastel chalks. Story: Worry could be my middle name sometimes. I tend toward bouts of insomnia. Sometimes I just can’t seem to quiet the ideas running through my head. I have started writing those down. Other times I might worry about finances or problems on the job. I am still learning how to trust God with my life. But if I were to recall how the Lord feels about wildflowers, even in times that I don’t get it, He is caring for every one of my needs, and even the spiritual. Consider how we think we must do this or that to please the Lord when He has taken care of what is required? We do, but not to get, for He has already granted to us eternal life, for the asking. What we do is instead, for loves’ sake. For He first loved us even more than the well dressed flowers. Materials: Completely made with melted Crayola Crayons. Thought: What does it mean to be holy? God is holy and his holiness cannot accept the sight of sin. We are to worship God with reverence and awe. But thank God indeed for His son Jesus Christ, who paid the penalty demanded by a Holy God in order to save humanity. That was the purpose of going to the cross. To save us. To save me. And I am indebted for always. God is love. God is holy. His love and holiness in Jesus who willingly became the bridge between man and God; a holy sacrifice. Our own righteousness is as dirty rags. It is through Christ that we can be in the presence of the Lord God. Materials: Paints in acrylics and fabric paint. Glass glitter by Recollections. “What supports its foundations and who has laid its cornerstone?” Job 38:1-7, emphasis on v. 6. A cornerstone will sometimes be referred to as a “foundation stone”, and is symbolic of Christ, whom the Apostle Paul referred to as the “head of the corner” and is the Chief Cornerstone of the Church.” Romans 2:20. Jesus Christ is the cornerstone of our faith - Christianity. Jesus said “I am the way, the truth, and the life. No man comes to the Father except through me” (John 14:6). There are those who would minimalize Jesus importance, thus not recognizing His sonship and/or equality with the Father. He is the quintessential part of all of this; the Cornerstone. You can’t usually get into a house without going through the door and He is that door to God’s house. “Trust in the Lord with all your heart and lean not on your own understanding. In all your ways acknowledge Him, and he will direct your paths.” Proverbs 3:5-6. 1. Trust God with all your heart. 2. Don’t depend on your own understanding. “For now we see in a mirror dimly, then face to face. Now I know in part; then I shall know fully, even as I have been fully known.” 1 Corinthians 13:12. “For my thoughts are not your thoughts, neither are your ways my ways, says the Lord. “For as the heavens are higher than the earth, so are my ways higher than your ways and my thoughts than your thoughts.” Isaiah 55:8-9. God sees the whole picture. The name of the artwork, Covering, is about trust. Trust in God over trust in ourselves. I know that if I start out my day without focusing first on my relationship with the Lord or I face a situation without taking counsel, it’s like walking into an ambush. And I realize my own thoughts are not as God’s thoughts. Materials: Strips of fabric and lace with crayon wax by Crayola. “Even though I walk through the darkest valley, I will fear no evil, for you are with me; your rod and your staff, they comfort me.” Psalm 23:4. This Psalm and many others speak of Christ. I think sometime after making my decision to follow Christ public, I went through a time of testing. Jesus went through a time of testing in the wilderness. Perhaps this was one of His valleys while on earth. And He is our Shepherd. “God is Spirit and those who worship Him must worship in spirit and truth” (John 4:24). “The kingdom of God does not come with observation; nor will they say, ‘See here!’ or ‘See there! "‘ For indeed, the kingdom of God is within you” (Luke 17:2—21). “But we have this treasure in earthen vessels.” (2 Corinthians 4:7). A deeper relationship with Jesus Christ in our lives. “As the deer pants for streams of water, so my soul pants for you, O God.” Psalms 42:1). I love the sound of a waterfall or simply rain pouring down. In times when I was having a particularly difficult day, I found that standing under the shower head with the water just pouring over me was like it was washing away pain. And I have felt the need or desire to go deeper in my faith and be more purposeful in my walk with the Lord. The Spirit of Christ is in me. At times feeling driven to prayer over others. I do think that as our relationship deepens with God, it should likewise deepen toward others. Story: Aside from John 8:32, Jesus has said of himself, I am the way, the truth, and and the life….”John 14:6. I recall a time when I attended a women’s gathering at a Salvation Army Church. At the end of the service, people were encouraged to come forward for prayer…..either for salvation or deliverance. I questioned to myself whether I needed for prayer to recommit my life to Christ or for deliverance. Maybe it was both. I remember praying before going to this thing that I was going with the expectation of hearing from God. I was in a mode of searching. I remember the struggle it was to get up and go forward. Others around me noted it too. I finally went forward and by the time it was my turn, I decided to ask for a prayer of deliverance. I explained it was because I was so often angry. It was actually frustration in my life. So they prayed for me and a woman came up to me and encouraged me, telling me God loved me and some other things which I am no longer clear in memory about. Positive things. Anyway, I know that deliverance is possible because I knew the truth (Jesus) whose Spirit resides within me. And I am set free.by that truth. I think the inspiration for this piece in part came from watching a science experiment where someone was creating a kind of element garden. It was fascinating. I forget what all the components were. But it was quite colorful and strange. When I was done with my own artistic rendition of this, it struck me as a winter scene. Materials: Napkin paper, tissue wrap in blues and whites. “Out of the ground made the Lord God to grow every tree that is pleasant to the sight, and good for food; the tree of life also in the midst of the garden, and the tree of knowledge of good and evil.” (Genesis 2:9, KJV). Materials: White canvas panel, 12x12, various floral leaves and petals, strips of cloth, sewn embroidery floss, acrylic paint and crayon wax. “Your name is engraved on the palms of His hands and the walls of your life.” (Paraphrase of Jeremiah 49:16). Materials: Acrylic paints in greys, white and pinks. Shell and silk flowers around the border. Materials: Canvas panel, melted crayon wax, silver glitter glue, white paint pen by Recollections. Could be a nebulae or galaxy, yes? That’s what came to mind for me. I have seen some beautiful photos of the real thing out there. God is an awesome designer!! Materials: Pebeo Vitrail paints and tissue papers. I was experimenting with this as it leaves a glass effect. Very different. The verse here is part of instructions to the Levites. These ones took care of Priesthood duties. Basically the instruction is that what was given to God by the people would be used to help support the Levites. A similar verse encourages the Christian to give first to their home church (God’s storehouse), which in turn those funds are used to help those in the church. God giving back what is given to him. At least that is how I see it. It is interesting too, that ancient tithing practices had to do with the produce of people’s land, i.e., food. God has a plan in the fullness of time….His time. Ever asked what God’s plan for your life is? KInda like asking a guidance counselor what you should be doing? I believe that in God everything will work out. The continuous circle patterns in this piece is symbolic of time. “Then the man and his wife heard the sound of the Lord God as he was walking in the garden in the cool of the day, and they hid from the Lord God among the trees of the Garden. (Genesis 3:8). I can only imagine what the moment was like after Adam and Eve chose to disobey God’s command. You might think automatically that God would be angry. But He was grieved. We know that He knew they would do this, though. And He had a plan. It was a plan that would not allow them to stay in the garden. Kept from the tree of life so that they would not live forever in the sin in which they had fallen. Materials: Encaustic gesso, crayon wax, cloth hawaian style flowers and varnish gloss. “On either side of the river was the tree of life, bearing twelve kinds of fruit, yielding its fruit every month; and the leaves of the tree were for the healing of the nations.” Revelation 22:2. The Tree of Life which was once in the garden of Eden will again be a part of heaven. Materials: Oil paint and Crayon wax. I wanted to address the subject of death from a scriptural point of view. I was also fascinated by the stories behind the Mexican celebratory tradition of The Day of the Dead. One of those traditions was the making of Sugar Skulls in remembering loved ones who had passed away. 1. The place where Jesus was crucified outside Jerusalem is called The Place of the Skull, or in Hebrew, Golgotha. (John 19:17). 2. Some of the beads I added to the work you might notice look like a deck of cards. I felt that was appropriate as Jesus clothing was gambled for at the foot of the cross by the soldiers. (John 19:23-24). 3. As to our loved ones…in the early days of the faith, people became concerned that (as they were waiting for the Lord’s return) their loved ones would somehow miss the Rapture. Paul addresses this concern in sharing with them that their loved ones who died having accepted Christ as their Savior, would rise in Christ first, followed by the rest of the believers in the air. (1 Thessalonians 4:16). 12x12 Canvas, Mixed media acrylic and ink. Grace is unmerited favor. “Gracious words are a honeycomb, sweet to the soul and healing to the bones.” Proverbs 16:24. Materials: Honeycomb stencil by TCW used with Whipped Spackle by Faber-Castell. Spray paints by Tulip, liquid acrylic paint, and Alcohol Inks by Adirondack. Gold glitter glue by Studio. Do not be proud nor conceited. Be willing to associate with those in low position. Be at peace with everyone as far as it depends on you. No revenge….leave room for God’s wrath, for vengeance belongs to God. “But as for you, Daniel, conceal these words and seal up the book until the end of time; many will go back and forth, and knowledge will increase.” Daniel 12:4 (NASB). Paul told Timothy that in the last days many would be ‘ever-learning, and never able to come to the knowledge of the truth.” (2 Timothy 3:7). It has been said that in the end days that knowledge will increase exponentially. At the same time the knowledge of God may be decreasing. It certainly seems that way today. Materials/Tools: Adirondack Alcohol Inks, Fabre-Castel Gelato Sticks, home made texture paste (1/2 cup baking soda [or you can use talc powder], 1 tbsp glue, 1 to 2 tbsp white acrylic paint), Americana Stencil - Short Circuit. “Do you not know that your bodies are temples of the Holy Spirit, who is in you; whom you have received from God? You are not your own; you were bought with a price. Therefore, honor God with your bodies.” 1 Corinthians 6:19-20). I imagine the pumping of the heart, the heart of the temple which is our body. “Those who have insight will shine brightly like the brightness of the expanse of heaven, and those who lead the many to righteousness, like the stars forever and ever.” (Daniel 12:3). God only knows the count of all the stars of the Universe and the expanse of the heavens. Materials: Crayonwax, stencil pattern with texture paste and clear bead gel. “But when she could hide him no longer, she got a papyrus basket and coated it with tar and pitch. Then she placed the child in it and put it among the reeds along the bank of the Nile.” (Exodus 2:3). Did you know that the name Moses means “drawn from the water”? It’s the name given him by the Egyptian woman who pulled him from that floating basket. Sometimes I think that there is always something unique about those who are called to become leaders in God’s kingdom. Materials: Tissue gift wrap paper, crayon wax. “Your eyes have seen my unformed substance and in Your book were written the days that were ordained for me, when as yet, there was not one of them.” Psalm 139:16. I know this passage is often quoted in regard to physical birth, but on another level, it can be a reminder that the gifts in our lives and the things we might do, the Lord knew all about us before we came to be. He sees our capabilities before we do. Materials: Acrylic paints, Adirondack inks, texture paste stenciled. It is a common way for God to speak to us (though as noted, no one perceived it, usually). Takes time to understand our dreams and that they can come from more than one place. As I learned it, they can come from God, from the Evil One, and from ourselves. It is discerning from where they come that is the question. Some dreams are those about things of the world and many are about ourselves. Materials: Acrylics in purples, greys, blacks, and white. Embellishments include ribbons in black and white, black rubber rope string, red and silver beads and bling. This was originally an experiment for a contest in consideration with a gothic theme. “Likewise the Spirit helps us in our weakness. For we do not know what to pray for as we ought, but the Spirit himself intercedes for us with groanings too deep for words. And he who searches hearts knows what is in the mind of the Spirit, because the Spirit intercedes for the saints according to the will of God.” Romans 8:26-28. Materials: Pebeo paints, Vitrail and Moon Fantasy; Tissue papers, A feather, Chain with crosses and heart, lattice diamond stencil for background. Synonyms for intercession is mediation, intermediation, arbitration, conciliation, negotiation. Prayers of intercession would be the action of saying a prayer on behalf of another person. I recall a painting by an artist (name of painting or artist I don’t recall), but that it depicted Christ as an attorney in a courtroom. A girl sat at a table with a long list of charges and Christ with her, possibly interceding and signing the document. I remember thinking that if I ever saw it again and could afford it, I would buy it. Have not seen it again since those days I saw it last. “Blessed be God who has heard my prayer, and not turned away His mercy from me.” Psalm 66:20. Invocation: the act or process of petitioning for help or support; a prayer of entreaty (as at the beginning of a service or worship). Sometimes prayer is thought of as the last thing we can do. We so often depend on our own power to do anything. But prayer is the best thing we can do. And God is listening. Especially in times where I have struggled with issues in my life and He still hears me. Truly, blessed by God who has heard my prayer and not turned His mercy from me. Consecrate the fiftieth year and proclaim liberty throughout the land to all its inhabitants. It shall be a jubilee for you; each of you is to return to your family property and to your own clan.” Leviticus 15:10. This scripture is on the Liberty Bell. It is only for freedom of all (including the Christian), that people are free to live and practice those beliefs without fear of persecution or other retaliation. This belief is what has set America as unique among the rest of the world’s nations. Did you know that our nation is the only one so far that has not thrown out or changed our constitution the way other countries have? In fact, France has gone through fifteen constitutions in the same amount of time America has kept her one. But there are those who want to get rid of our constitution today so we can be just like everyone else. We are in the tail end of the last days. Signs of it are in the increased racism and hatred toward the Jew and Christian. I suppose these things have to be before the Lord’s return, but until then, it is the Christians duty to occupy till His return. Materials: ribbons, threads, lace, acrylic paint, gesso, feathers, pennies, half a styrofoam cup and aluminum. Also called the coiling serpent, writhing/twisting serpent and dragon of the sea. From various commentary I have picked up that Leviathan, besides being a name of Satan, has also been given to all enemies of God and His people….different nations and kings at different times, as it was common to describe enemies by the names of vicious and ominous creatures. It is in that sense alligorical. Today we often use the term Anti-Christ, seen both as a particular person as well as speaking of the spirit of antichrist we see in the world today. I think of leviathan as that. We know that Satan is referred to as a serpent since the time of the Garden of Eden. So to me, ultimately, leviathan is a term describing Satan, enemy of God and man. This verse is actually part of the parable of the Wandering Sheep. New believers are often considered spiritual newborns, but I also consider this verse in regard to all little ones. This piece is about children and the memories and symbolism of our childhood. It is also in memory of Zayla. Materials: Napkin and tissue papers, ribbons, lace, bling, miniature cups and saucers, buttons, caps, and angel drops. Water is considered a symbol of the Holy Spirit. The day I asked the Lord Jesus to become my Savior and come into my life, something changed. I imagine it is like the verse of John 4:14. It is one of life and power. I like to think that all things that have happened in my life as a believer, God has meant only for my good. Gifts come in many different shapes and sizes. While being thankful for the good things in our lives and the people, it helps to remember ultimately that God is in charge and so whatever we are going through, He has our back. In Him we have our purpose. And unlike “shifting shadows” God does not change, does not shift like the shadows. Shifting (adjective): “shifting objects, lights, or shadows frequently change their shape or appearance. shifting patterns of light. Able to be changed and lasting only a short time: variable, brief. What this verse does not say is that we won’t have enemies. We will definitely have enemies and the world as a rule is against the follower of Christ. But, as we choose to follow God’s ways in our life, God himself will work it out between us and those who despise us. I know of some who have gone out of their way to try and hurt me because of my faith, and some were closer than my neighbors. The world can be scary, but it is possible in Christ to have love, hope, and peace in a world upside down. Sovereign power, authority or dignity; used in addressing or referring to reigning sovereigns and their consorts. It is in understanding God’s holiness, His majesty, that one may start to understand how great a gift of salvation has been given to save man, God’s crowning glory of all creation. The Hebrews had to leave a land that had been good to them, but turned on them (as was God’s plan in order to bring them to another land of God’s choosing). And they had to face up to those there in the new land to take it over as well as their own fears and failings. Likewise in my own life, I found myself working for an employer that once treated me well but then turned against me, and God used the situation to bring me out of there. I am in another place for now. God put me there to grow and be fruitful and experience some needed opportunities in my life. No, the place is not perfect, but neither am I and the growing part is usually in the difficulties. I have learned it is only God which makes things happen. It is the Creator who brings life regardless who it was that planted or watered or otherwise took care of something or someone. It is the Holy Spirit which brings a person to salvation. It is not the messenger. It is God who multiplied the numbers of the early church stated in the book of Acts. It is a good thing to be a part of God’s plans. But it is God who is to be glorified in the good of His plan of salvation to humankind. Growing from small beginnings is the theme of this parable found in the gospels. The mustard seed represents the Kingdom of God. Starting from small beginnings, but one day, growing and becoming like a tree, so that even the birds of the air come and lodge in its branches. (Matt 13). In chapter 17, Jesus heals a possessed boy. The disciples in private ask why they could not cast out the demon. He tells them it is because they had so little faith. I have always thought of faith as believing in what you do not see; the mustard seed as symbolic of faith that grows and does not quit. “Heaven and earth will pass away, but My words by no means will pass away.” Matthew 24:25. We live in a time where everyone is trying desperately to save the earth. For sure, we should be better caretakers than we have been. But in the end we are trying too hard to hang onto the perishing while ignoring the eternal. The One who made it all will one day restore it for its original intent. For now, He starts with us, what He considers the pinnacle of His creation…..people. That’s why Jesus came to die on a cross, to pay for our sins that we would be restored to the relationship with God taken from us through the actions of our first parents. Materials: Acrylic paint and texture paste. “And there is salvation in no one else, for there is no other name under heaven given among men by which we must be saved.” Acts 4:12. This is but a small list. There are more. I believe the name Jesus of itself means salvation. Materials: Melted crayon wax, etchings, Liquitex Inks. “and provide for those who grieve in Zion - to bestow on them a crown of beauty instead of ashes, the oil of of joy instead of mourning, and a garment of praise instead of a spirit of despair. They will be called oaks of righteousness, a planting of the Lord for the display of his splendor.” Isaiah 61:3 (NIV). This passage is a prophesy of Israel becoming a nation as they most certainly did in 1948. One of the signs of the beginnings of the Lord’s soon return. Interestingly, the fig tree is the third tree to be mentioned by name in the Bible; the first being the Tree of life and the second the Tree of the knowledge of good and evil. Adam and Eve used the leaves of the fig tree to sew garments for themselves after the Fall, when they realized they were naked. (Genesis 3:7). This is an abstract version of the fig tree, likened to what a blooming fig tree might look like. “An excellent wife who can find? She is far more precious than jewels. The heart of her husband trusts in her, and he will have no lack of gain. She does him good, and not harm, all the days of her life. She seeks wool and flax, and works with willing hands. She is like the ships of the merchant; she brings food from afar…(Proverbs 31:10-31). This piece was inspired by a dream or nightmare I felt driven to figure out. Materials for the original: Acrylic paint in greys, browns, and creams. Gem Stones (Ashley), in black and fiery orange red. Feathers in black, yellow, red, orange and white arranged over a tree branch. Blackbirds clipart and verse in black marker. (Original is a gift for my grandfather). Bad circumstances do not make you bad. They do not mean God has abandoned you. He promised to be with us in everything. “Shepherd Your people with Your scepter, the flock of your possession which dwells by itself in the woodland, in the midst of a fruitful field. Let them feed in Bashan and Gilead, as in the days of old.” (Micah 7:14) It is for Israel that Micah asks of God to be merciful. Even while in the midst of judgment, the Lord still cares for their needs, just as the way He would care for any of His children. “For there will be peace for the seed: the vine will yield its fruit, the land will yield its produce and the heavens will give their dew. And I will cause a remnant of these people to inherit all these things.” (Zechariah 8:12). All that I have or am able to do well comes from the Lord God. The rain and the sun comes to me with purpose. Materials: Gouache is an opaque type of watercolor. The natural world is a testament to our Creator. Out of nothing all this was created. That spirit of creativity is thus also part of mankind. The original was a birthday gift for my mother. Materials: Crayon wax, silk flowers, encaustic gesso, gel medium, and clear varnish. “To the angel of the church in Laodicea write….’I know your deeds, that you are neither cold nor hot. I wish you were either one or the other! So, because you are lukewarm — neither hot nor cold — I am about to spit you out of my mouth.” (Revelation 3:15-17). “Now, when they had gone, behold an angel of the Lord appeared to Joseph in a dream, and said, ‘Get up! Take the Child and His mother and flee to Egypt and remain there until I tell you; for Herod is going to search for the Child to destroy Him.” The story: At the time an angel instructs Joseph to take his family to Egypt for awhile. Jesus is now 2 years old and the Magi (Astronomers) have just departed. Herod’s intent is to kill every child in Belthlehem 2 years of age and younger. Materials: Feathers, florals; and faux pears. Crayon wax in colors of gold, olive green, mustard yellow, copper, coral and white. What started out as an idea for the carol, The Twelve Days of Christmas, became totally something else. I left some influences in, though, such as the pears. Also, in Acts 10:9-23, in a vision, Peter is admonished not to call impure or unclean what God has called clean. Materials: Feathers, miniature dream catchers, crayon wax.